As of June, 2016, there have been two discoveries of alleged Islamic State plans to commit atrocities in Falluja, which they would blame on the Iraqi military and allied (largely Shia) militias. Both revelations came amid news or concerns about those forces pushing to re-take the restive Falluja, which was the first major city in Iraq to fall to ISIS in early 2014. Some observers reasonably take the orders at face value as evidence of plans to frame the liberators for sectarian crimes that will feed resistance and resentment. But there is good cause to doubt the authenticity of these documents, especially now that they've been conveniently discovered at the right time twice now. So far, western mainstream and even much alternative analysis accepts them as fakes, even obvious ones. Many blame what some term "genocidal Shia militias" to give themselves "carte blanche" to kill Sunnis and frame ISIS. But there's also good cause to doubt that. First widely noted and declared a likely fake in late December, but apparently first circulated in mid-October, 2015. Iraqi forces were then pushing the conquest of nearby Ramadi, with Fallujah still a distant goal. It's dated Dhul Hijjah, 23 (or possibly 12/13) = Sept. 25 (using Islamcity.com Hijri-Gregorian converter) - about 3 weeks before the found copy was published - as it happens, on the second day of 1437 (Wikipedia). Dec. 22 tweet by Col. Steve Warren, top US commander, claiming it as a legitimate ISIS false-flag plan. As cited here, he elaborated "Clearly, this isn't the behavior of a legitimate government or of a legitimate military force, it's the behavior of thugs, it's the behavior of killers and it's the behavior of terrorists." Col. Warren's tweet came just as Iraqi forces were taking central Ramadi (BBC), sealing that conquest and setting the stage for Fallujah. Business Insider article argues for the order being fake, citing experts who suggest it was Iraqi and allied (lagely Shia) militias who created the fake, in an effort to blame ISIS for their own planned crimes. By using obviously fake IS documents to condemn the Islamic State the U.S. military creates the opposite effect. That the U.S. needs fake evidence to let the Islamic State look bad actually makes it look better than it is. This not only in the eyes of its followers. Analysis by Monitor on Massacre Marketing (ACLOS affiliated) focuses on the bad image it gives to the Iraqi military and allies - the possibility of a double-fake, made perhaps by ISIS to appear like an obvious forgery by others, and setting the stage for any atrocity to be blamed on the supposed fakers. This was actually the #October, 2015 Discovery getting belated attention. 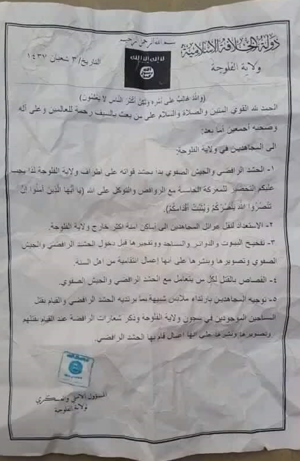 First talked about on or before May 23, this different paper was said to be found in an Islamic State headquarters somewhere overrun by pro-government forces, then beginning their push into Fallujah, and then shared widely by sympathetic channels. Issue date: perhaps May 9/10, unclear - it's in the Hijri system with year 1437 used, date seems to be 2 or 3 Shaaban = 9 or 10 May (using Islamcity.com Hijri-Gregorian converter). 1.Prepare to move the families of the Mujahideen to a safer place outside the Falluja province. 2.Booby trap houses, offices, and mosques (with explosives) and detonate them before the Shiite militias and the Iraqi army enter (the city). Document and publish it and say these are retaliatory acts (by Shiite militias) against the Sunni people. 3.Execute everyone who cooperates with Shiite militias and the Iraqi army. 4.Instruct the Mujahedeen to wear uniforms similar to those of the Shiite militias, and execute prisoners placed inside the prisons of the Falluja Province. Document the killings while chanting Shiite slogans and publishing them as acts committed by the Shiite forces themselves. But Vocactiv cites Aymenn Jawad Al-Tamimi again questioning this document's veracity. "He says the Iraqi military or Shiite militias likely created it to pin the blame for any acts of destruction and war crimes that might take place during the fight for Fallujah on ISIS. “It’s similar to the fake tweeted by Col. Steve Warren in December, albeit slightly improved,” Al-Tamimi said in a Facebook message to Vocativ on Tuesday." 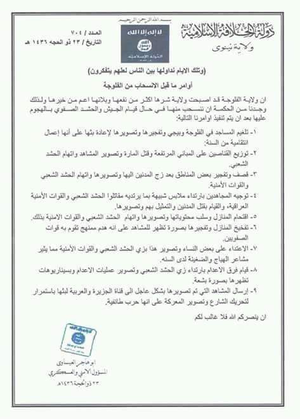 The document was shared widely on Monday among Twitter accounts affiliated with Shiite militias and the Iraqi army. One army-affiliated account posted images allegedly showing a man holding the document, and claimed Shiite fighters found it in one of ISIS headquarters. These sources might consider that information (like left-behind documents) can also be booby-trapped to harm you. June 1 Dr. Tim Anderson on Facebook: "The modus operandi of NATO-backed terrorist groups... What DAESH, Nusra and FSA have in common." This shares the document with translation by Press TV reporter Ali Musawi, and attempted discussion with both by Adam Larson (ACLOS member Caustic Logic, and author of the Monitor on Massacre Marketing analysis) about the possibility this is counterfeit evidence. This page was last edited on 8 June 2016, at 23:20.